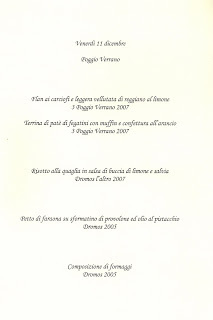 Very enjoyable wine-maker dinner at Ristorante Ai Beati near my hometown Verona. Located in a privileged position above the village of Garda and surrounded by magnificent olive trees, the restaurant is inside a refurbished ancient frantoio (olive mill). It enjoys an enchanted view of Lake Garda. If you are in the area I recommend to try it. The cuisine offers meat and fish dishes. Your host is Pierfrancesco and his wife. Here the menu. Excellent pairings with our wines! !